Mini auctioned for charity | What Car? 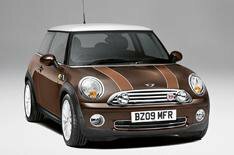 A new Mini Cooper Mayfair worth 18,500 will be the star prize at a charity auction next month. The London Press Club Ball takes place on Thursday, October 15, at the Brewery in Chiswell Street, London. Proceeds from the event will go to Journalists' Charity, which provides journalists in need with grants and other financial assistance. BBC Breakfast presenter Kate Silverton is hosting the event, which has 'austerity' as its theme. James Braxton of BBC's Bargain Hunt is conducting the auction at the Ball, which is now in its fifth year. Barclays and Camelot are the major sponsors and the ball patron is Sly Bailey, chief executive of Trinity Mirror newspaper group. Key supporters include Associated Newspapers, News International, Telegraph Group, the Guardian, and Mirror Group. For more information, go to www.the pressball.com.